As the first world wide destination in USA and with great ranking world wide, Orlando Florida is always on demand for entertaiment, with a bast offers of hotel, resorts and the adventure and magical memories of more than 10 theme parks Orlando Florida might be intimidating when approaching your dream vacation. 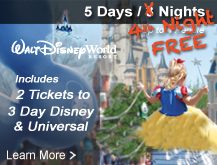 Defineteley it does not have to be like that, Orlando Discount Tickets USA extend vacation packages that start on $169 dollars during low season and includes 4 days and 3 nights and admission for 2 adults for 1 day disney or universal. The most efective way to save money when visiting Orlando, is attending a Resort Preview which is a marketing meeting that you attend the following day of arrival taking about 120 minutes of your time. The most popular theme parks are Magic Kingdom, Universal Studios, Seaworld, Island of Adventure and Seawolrd, that represents 3 different companies Walt Disney World, Universal Studios Resort, and Seaworld Entertaiment. The offers at discounted price could be hotel accommodation plus tickets or simply the admission for the theme parks. This offers are in many places but it is very important to know the terms and conditions involve and verify that the company you choose to buy the discounted vacation package with really exists and it is legitimate. Single Females on his own do not qualify, the offers are exclusively for married, cohabitating couples or single or legally divorced females. Couples must attend together. The age for the married couples is over 26 years old and for the single females is over 30. Requirements of income over $50.000 annual household income is required and presenting a credit card at the presentation even you don’t have to pay with it is a must to qualify. To have clear expectations of this offers is necessary to know that presentation are schedule the next day after you check in in Orlando and there will be place on a resort subscribed with the company that sold the offer. Usually is the near place to your location. The time of the presentation takes an average of 90/120 minutes and once it is completed you receive any tickets or deal you got with the company you book the package. Be very carefully do not buy more than one offer because you can be disqualified, Orlando Discount Tickets USA with more than 10 years of experience can assit you and gice you great discount on your discounted vacation pakages by attending one of its resort previous, explore the great value of the deals at www.orlandodisocuntticketsusa.com. Disney Epcot International Flower and Garden Festival is an annual event at Epcot during spring. This event shows more than 100 topiaries all around the theme park , visitors will see new topiaries of Belle from “Beauty and the Beast,” a “Cars”-themed area in celebration of the upcoming “Cars 3” and a 6-foot-tall Figment from Epcot’s Imagination Pavilion. There are an abundance of food offerings—with tapas-sized dishes and desserts plus drinks!—at the outdoor kitchens scattered around World Showcase. The Sounds Like Summer Concert Series takes place every summer at Epcot. Every night at the America Gardens Theatre, guests can sit back and listen to some of the world’s greatest tribute bands. “Don’t Look Back” A Tribute to Boston, “Hotel California” A Salute to The Eagles and “Simply Tina” A Tribute to Tina Turner were some of the bands that played last year. 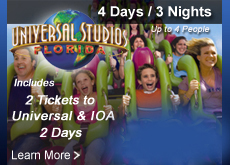 Orlando Discount Tickets USA has great promotions for you that includes hotel acomodation and tickets for the first 2 people for the theme parks in Orlando. The vacation packages start at $169 dollars per person to receive 4 days 3 nights and tickets for 2 people 1 day disney on the regular season. Star exploring Orlando Discount Tickets USA to get a vacation packages or tickets for the theme parks in Orlando. The biggest news for the Univesal Orlando Resorts is the oppening of Volcano Bay Water Park that will open their gates to the public in 2017 with its major attraction Krakatau the fire and wáter volcano that visitors are already visualizing from the Interstate I4. The goal for this new Theme Park is play and relax and it is the result of extensive reseach marketing about how to improve theme parks experience. Legoland Florida Resort on 2017 will let aspiring ninjas practice their Spinjitsu and battle enemies of Lego Ninjago The ride. Seawolrd Orlando durimg 2017 will have 4 new changes or additions. First, the Seven Seas Food Festival including tasting food form Asia, the Caribbean, South America and the Mediterraean, during summer a redesing nursery will be ready for the Dolphins, third on summer 2017 new technology lights with bioluminescent lighting will be part of the closing show and the last improvement on visitors experience will be on Kraken with digital upgrades. If you are looking for vacation packages at Discounted prices explore Orlando Discount Tickets Usa with multiples options of Hotel and Resort acomodation starting at $169 for the vacation packages that with one day admission. Also if you already have hotel acomodattion explore ticket promotion for the theme parks at Orlando Discocunt Tickets USA and receive up to 50% discount on your admission by participating in one of resort previews.